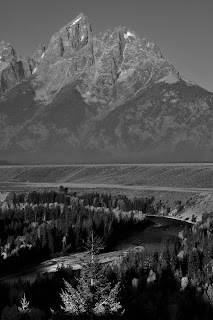 We were in the Tetons, therefore we had to stop at the spot. The scene was pretty boring - blue sky is nice but boring. So went the black and white route. Also in honor of Ansel. I wonder how many times this place has been photographed? My first black and white post - what do you think?